Sustainability - Youth Voices Center, Inc.
Below is a recent report demonstrating Youth Voices Center’s ongoing sustainability efforts with regards to its Power of Peace Program. Following an intensive series of youth Level 1 workshops, participating schools are asked to host a staff only workshop with Michael Arterberry at the helm. Youth Voices Center welcomes comments and recommendations to further shape its programming. These joint efforts promote long term growth and impact within the lives of the participants and the environment in which they grow. A faculty driven Power of Peace workshop was conducted at Hudson High School on October 24, 2014, with participants including all school staff and administrators. This was a crucial follow up to the ten, Level 1 workshops conducted at Hudson High School, in September and October of this year, involving 150 students over the course of six weeks. Each Level 1 workshop requires at least two teachers in attendance. 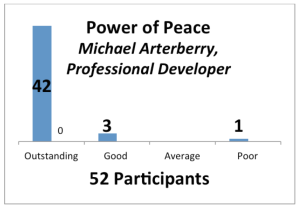 As a result, teachers expressed that Power of Peace cultivated a better understanding of the program itself, as well as the impact it had on the environment of the building. 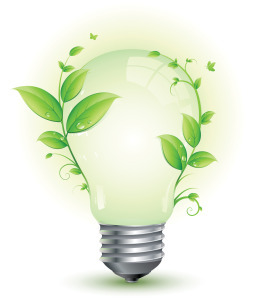 As part of Power of Peace sustainability efforts, all schools with participating students should have an adult/staff only workshop to lend insight into expected student and environmental transformations. Additionally, it enables teachers to better understand students themselves in order to better educate them. On the following pages are various comments from the participants of the Hudson High School faculty Power of Peace workshop, as well as staff recommendations. I don’t teach math, I teach students. Getting through to my students is my biggest challenge. The content, whether it’s 2005 standards or Common Core, is the secondary challenge. I hope this program will help all teachers make better and more meaningful connections with their students. Outstanding – it applies to many on different levels. This is PD that we can use. This workshop was excellent because not only did we learn more about Power of Peace, but we got to be together as a staff. I have felt the faculty is so isolated as we try to do all we have to do with APPR that this was a good opportunity to connect. I learned so many things about my colleagues that I feel will build a greater sense of community among all of us. Thank you for what you do! I thought this was a very powerful workshop and to be able to share on a personal level with colleagues was important and necessary. Thank you. I really enjoyed the activities and the fact that we got to get up and move around. I feel that not only does this help us understand our students, but each other as staff. 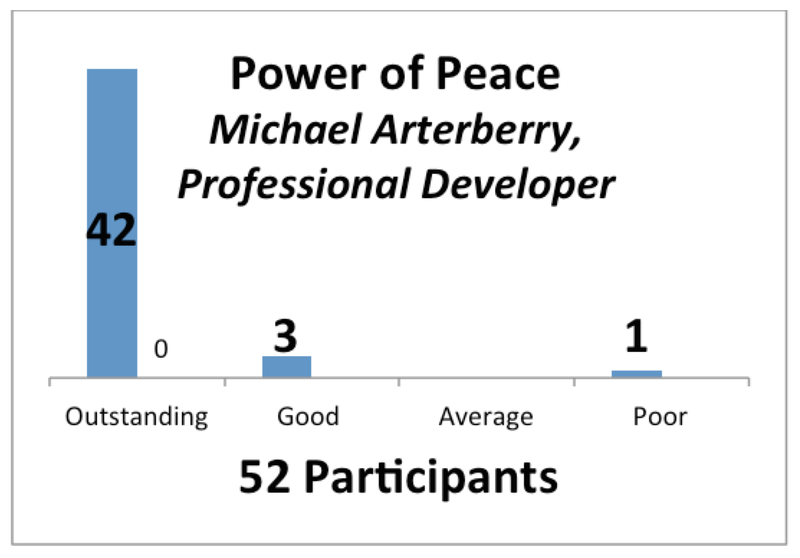 I attended Power of Peace last year and experienced first-hand how powerful this program is for both students and staff. I am hopeful that this program with staff only will help build relationships between staff. It’s great to remind all of us just where our kids are coming from. Nice break from the same old thing. Nice to see colleagues in a different light. It was nice to enhance the teaching experience through a personal interactive workshop, especially being a new teacher. What a great way to get to know our colleagues and the issues our student face on a daily basis! Very personal, good for all involved. I enjoyed this professional development. Very revealing and made me appreciate it more. Good workshop, beneficial to teacher and student relationships. Glad to have all teachers involved. For the students, I think this can open up issues that they have not dealt with verbally in a group. Something like this very much needs further follow up versus group or individual therapy. To open up an issue and not follow it up further can be harmful. Please consider more in-depth follow up. It was great to get to know our staff. If our staff could interact more and not be strangers within the building, it would help to improve the climate of the building. It was great to hear about what our students deal with. Awesome! It’s important for us to learn about one another to work together in a smooth, effective manner. I like what you are doing, but not seeing improvement to freshman behavior. I wish that the questions had been tailored more to teaching. I think that it would have helped us explore who we are as instructors thereby making us better teachers. I also wished that we could have delved deeper into how to reach our students. Thought it was great to get to know my colleagues on a different level. More opportunities to work with the whole faculty on team building. Department time to create curriculum. More workshops with this model – team building/wellness. Want a Power of Peace 2. Two days for teachers and staff – smaller group. More workshops of this nature.